It’s the time of year that most think about getting away from their work routines and plan some vacation time. Siding with the majority, I left my professional happy place. An item on my bucket list, plus numerous invites from my sister, prompted me to take a vacation to the Amalfi Coast, Italy. One would think that the deep blue Mediterranean Sea combined with the smell of basil and tomatoes would be enough to lure this designer to relax her mind and get away from planning color palettes and logo marks. And, the relaxation was all going fine until I met an archaeologist from the University of Texas at Austin at dinner in Positano on our first night out. He shared his work passions for a place he was excavating called Villa Oplontis—an ancient seaside luxury villa that evidence showed was the playground residence for Emperor Nero’s second (and notorious) wife, Poppaea Sabina. Now I, like most tourists, knew about the lost city of Pompeii due to the earthquake at Mount Vesuvius in AD 74. However, I had not heard of The Oplontis Project and quickly recognized based on Dr. Michael Thomas’ descriptions, that for a designer, it was a must-see. After a long, windy ride to Naples, we arrived at Oplontis Villa A. Because it was more obscure to tourists, we were the only ones outside of a small group on a private tour that were on the property. A far cry from the masses of tour buses in Pompeii, just 15 minutes down the street. Even after 2000 years, the colors were vividly depicting life through the eyes of the artisans in ancient Roman times. 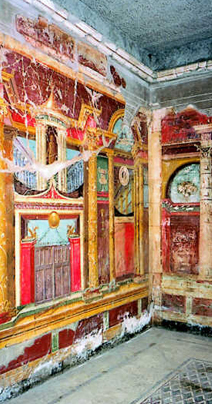 Romans painted directly on the walls of their rooms and also on portable panels. Domestic interiors were claustrophobic, windowless and dark so they used brightly painted decoration in trompe-l’-oeil effects to visually open up and lighten their living spaces. As I was madly snapping pictures, an Italian gentleman noticed my intrigue and motioned me to follow him. Opening a chained-off area, he lead us to private areas of the Villa that beamed with color, style and adornment. We were amazed at the talent of these artists and how the skeleton of the drawings was revealed under the paint that was worn away. As is our world today, the planning and detail of visual communication made an impact on daily living and provided emotional engagement. These artisans probably never imagined that they would be creating an emotional response for a designer across the globe, thousands of years in the future. Inspiration can happen when you’re least looking for it. Are you ready for your next vacation?